The Maine Beaches (Southern Maine Coast), best known for its’ broad expanses of white sandy beaches, offers four seasons of fun for families and singles of all ages. Historic coastal towns including The Yorks, Wells, Ogunquit, The Kennebunks, and Old Orchard Beach offer an extraordinary selection of shops, restaurants, theater and nightlife. Museums and historic sites are many and range from lighthouses and forts to 19th century villages. Sporting attractions feature swimming, sailing, sea kayaking and saltwater fishing, as well as hiking, biking, and golf. Maine Event highlights include Chamber Music Festival, Beachfest, Beach Olympics, the Tri-State Fishing Tournament and the Winter Carnival. To see a map of York County and all towns in the county, click here. Other towns of interest include: Acton, Cornish, Dayton, Hollis, Kennebunkport, Lyman, Ogunquit, and Shapleigh. *Population figures are based on 2010 Maine census estimates. Sanford, Maine: January: 32.5 to 10.4, April: 57.3 to 32, July: 83.2 to 57.1, October: 62.5 to 37.1. Numerous white, sandy beaches from Kittery to Old Orchard Beach. 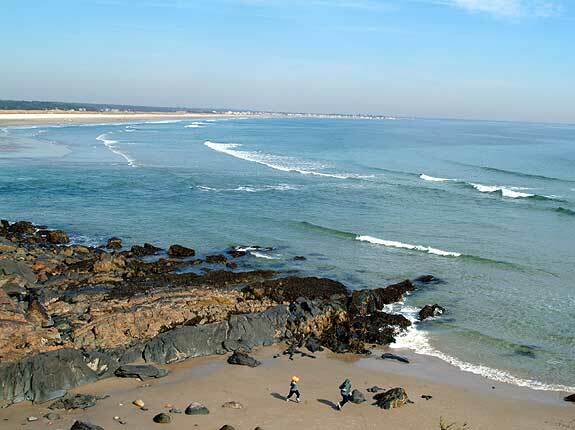 Ogunquit has one of the country’s top rated beaches. Ferry Beach State Park (Saco) and Vaughan Woods State Park (South Berwick). Biking, Hiking, Golf, Swimming, Boating & Sailing, Canoeing & Kayaking, Freshwater and Saltwater Fishing.